Come Visit Us! Open 8am - 6pm Everyday! Click Here for Weekly Specials! Fountains provide a focal point in your landscape and the running water provides both motion and sound. 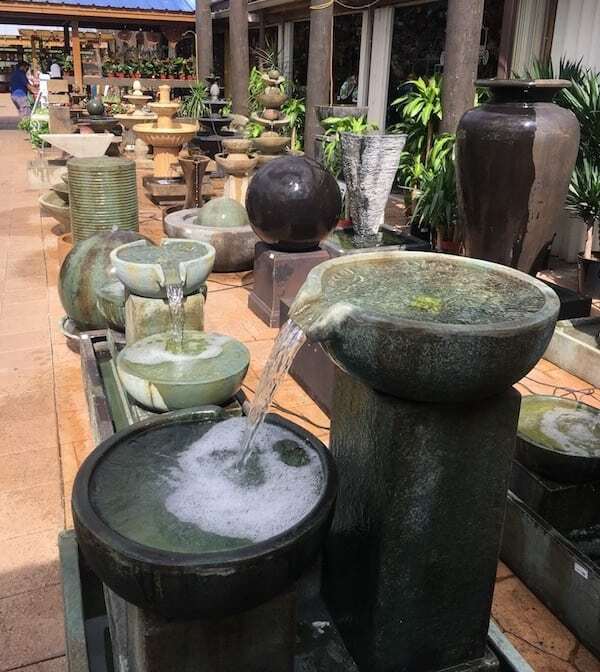 You will find the perfect fountain for your specific application at Flamingo Road Nursery because we have the largest selection in South Florida. We carry over 200 fountains in stock, constructed of concrete, resin, polycrete and glazed clay. Every style is represented, including classic, contemporary and Asian. Our installation department can provide delivery or turn-key installation of your fountain. We carry a full line of plant and hardscape materials to complete your fountain space, including decorative rock, boulders, bromeliads, driftwood and wall art. Our gift shop carries a comprehensive selection of small tabletop fountains, perfect for indoor use. The soothing sound of flowing water can add a fresh element to any room in your home or office. Come Visit Us Today! We’re Open 8:00am – 6:00pm Everyday! Click Here for our Weekly Specials! Flamingo Road Nursery is a garden center offering landscaping fountains & waterfalls, exotic plants, and much more. Serving residents of Davie, Sunrise, Plantation, Weston, Miramar, Hollywood, Pembroke Pines, Fort Lauderdale, and surrounding FL communities.